Farrar, Straus and Giroux, 9780374162252, 112pp. 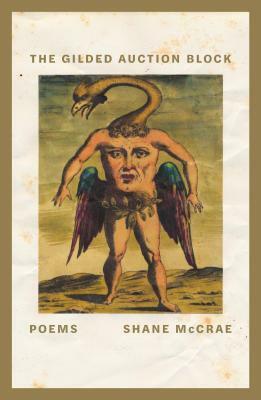 In The Gilded Auction Block, the acclaimed poet Shane McCrae considers the present moment in America on its own terms as well as for what it says about the American project and Americans themselves. In the book’s four sections, McCrae alternately responds directly to Donald Trump and contextualizes him historically and personally, exploding the illusions of freedom of both black and white Americans. A moving, incisive, and frightening exploration of both the legacy and the current state of white supremacy in this country, The Gilded Auction Block is a book about the present that reaches into the past and stretches toward the future. Shane McCrae is the author of In the Language of My Captor, which was a finalist for the National Book Award, the Los Angeles Times Book Prize, and the William Carlos Williams Award; The Animal Too Big to Kill, winner of the 2014 Lexi Rudnitsky / Editor’s Choice Award; Forgiveness Forgiveness; Blood; and Mule. He is the recipient of a Whiting Writers’ Award and a National Endowment for the Arts Fellowship. He teaches at Columbia University and lives in New York City.